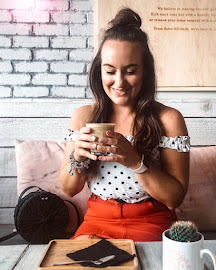 Travel is a huge passion of mine, I love exploring new countries and cultures and am very lucky to have travelled to a wide variety of places so when I found the Wanderlust Tag I knew I just had to do it! 1. Where was your first plane journey to? It was to Florida, America and I was 4 years old. It's no secret that I loved Australia when I was out there. Their way of life is so much more relaxed and it's somewhere I can see myself in the future. But I also love New York, it's been way too long since I've been there so I desperately need to make another trip. 3. You're leaving tomorrow, money is no object, where are you going? If I could go anywhere I would head to South America, I would love to visit Peru and walk the Inca Trail as well as going to Brazil. 4. Preferred method of travel: plane, train or car? Plane! I love them and they are just so easy. - My iPhone, you can take photos on it, google anything, I'd have been lost travelling without it. - Flip flops, the perfect shoes for travelling. - Journal, I love writing everything down from my travels so I can always remember it in years to come. 6. Where would you travel to just to eat the food? I love pasta so most probably be Italy, although I do love good burger so maybe America. 7. Is there a place you would never go again? I don't think so, I've enjoyed every place that I've travelled too, some maybe not as much as others but I don't think there is a place that I would never go again. 8. Can you recite your passport number from memory if asked? 9. Do you prefer the window, aisle or middle seat on an airplane? For short journeys I don't mind the window but for longer journeys I prefer the aisle as I can stretch my (short) legs and go for a walk without disturbing anyone. Never the middle seat though, I always feel too cramped! 10. How do you pass the time on an airplane? Watch films! I'm a major film lover and a long flight is the perfect time to catch up on all those films that you missed when they were at the cinema or ones that you have always wanted to see but never had time. I will literally watch films for the entire journey as I'm not the best at sleeping on planes. I love reading others peoples take on tags so if you do this one please link it below in the comments so I can have a nosey!